They amount to, at best, $300 million worth of cuts over the next three operating budgets. For 2012, the best case scenario sees $100 million worth of cuts, mostly coming in areas like transit, planning & heritage, parks & recreation, street cleaning & snow removal, policing and libraries. We could see further cuts to both policing and libraries (including branch closures) in 2013 and 2014. That $100 million in cuts does very little to fix the city’s perennial structural budget gap. It actually only barely covers the damage done in last year’s budget, when Council voted to significantly reduce revenues by cutting the vehicle registration tax and freezing property taxes. In essence, this fills the hole Rob Ford created and leaves us staring, rather fruitlessly, at the remaining shortfall — the same one that has dogged us since amalgamation. If it wasn’t clear already, this morning’s announcement should kill any lingering doubt that Ford has, rather spectacularly, violated his campaign promise not to cut city services. Ford voters now must look square in the face at a fiscal reality that says that damn near every dollar of revenue — taxes — removed from the city’s coffers must be complemented with an equivalent cut to service. 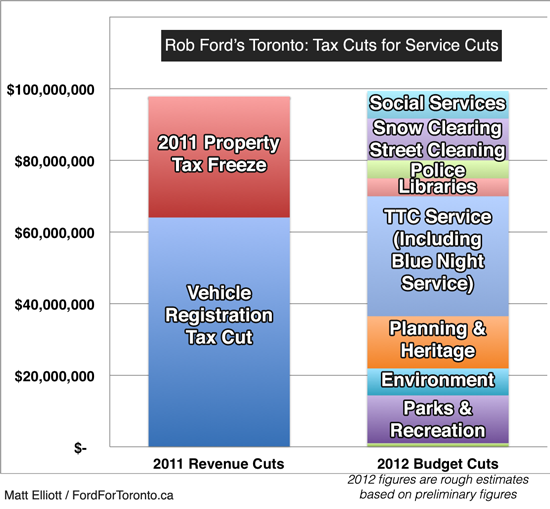 Most of the 2012 savings come from proposed TTC cuts, including to Blue Night service, which would have a devastating effect on low-income people across the city, particularly in suburban neighbourhoods. Many of the remaining cuts are nickel-and-dime stuff, and little analysis seems to have been done to measure the financial impacts cuts to services can have to other departments or agencies. City Manager Joseph Joseph Pennachetti has also passed the buck on a number of items, ensuring that we’re still several months away from a real debate about what to cut. Pennachetti recommends sending nearly all of the KPMG budget considerations back to various boards, committees and agencies, where they can be further debated, deputed on, and probably once again referred to executive committee. It’s an endless cycle, which cries out for the kind of fiscal leadership from the mayor’s office we were promised on election night. Rob Ford has sat in council chambers for over a decade’s worth of city budgets: it’s time we heard his ideas for plugging the budget gap. No more hiding behind expensive consultants and endless process. Deputants to committees, left-leaning councillors and progressives in the city have been called out several times by those in power for merely championing existing programs, instead of proposing solutions to the city’s budget shortfall. What became clear today was that those running the city — Rob Ford, Budget Chief Mike Del Grande, assorted council hangers-on and staff — have no real idea how to balance the budget either. Their last, best hope is to skate through 2012 with assorted surplus revenues, these cuts, and user fee hikes, and then begin a fire sale of city assets — including, as we learned last week, the Port Lands — in the inane hope that using those revenues to pay down capital debt gives them enough room in the operating budget to make things balance. It’s a bad idea that could significantly damage our city, and it continues to ignore Toronto’s only real path to fiscal sustainability: a coordinated approach to intergovernmental relationships, new sources of revenue — which must include consideration of road tolls and a sales tax — and a massive push for the provincial government to take back the funding responsibilities that rightfully belong to them. This entry was posted on Monday, September 12th, 2011 at 3:25 pm	and is filed under feature. You can follow any comments to this entry through the RSS 2.0 feed. Both comments and pings are currently closed.